ICEasy Test Suite | Marvin Test Solutions, Inc.
Marvin Test Solutions' ICEasy Test Suite is supplied with both the TS-900 and TS-960 semiconductor test platforms and provides a comprehensive set of software tools - facilitating the development and debugging of test programs for semiconductor devices. In addition the suite includes I-V curve and Shmoo plot tools for analyzing a device's DC and AC characteristics. The complete suite of tools interfaces seemlessly with Marvin Test Solutions' ATEasy®, a test executive and test development evironment which is supplied with each TS-900 / TS-960 system. Digital Waveform Edit / Display Tools: To facilitate the development and debugging of digital test vectors, waveform display and edit tools are available for both the TS-900 and TS-960 test systems. These tools provide interactive control of the digital subsystem as well supporting the ability to import STIL, ATP, VCE/eVCD and WGL digital test vectors. The ICEasy tool set is an ATEasy® add-on module that facilitiates device test program development. The tool set is fully integrated with the TS-900 / 960 instrumentation and by utilizing the TS-900's PMU per pin capabilities, users are able to quickly create test programs. Additionally, ICEasy supports pin mapping between DIO channels and UUT pin names, creation of Pin Groups and nested groups as well as providing the ability to perform various test functions on a group of pins. These preconfigured tests, when combined with ICEasy's Device Pin and Pin group mapping capability, provide the user with a simple and streamlined method to assign tests to specific device pins as well as specifying pass / fail limits for each test, without having to do low-level instrument setup and control. The result is faster test creation and faster time to test. For characerizing semiconductor devices, ICEasy provides I-V Curve and Shmoo plotting tools. Both tools can be used interactively or via an API, allowing the plots to be generated and saved to a log file. ICEasy's I-V curve tool allows users to easily set up voltage & current ranges and step increments as well as defining, by name, the specific pin (or pins) to be tested. 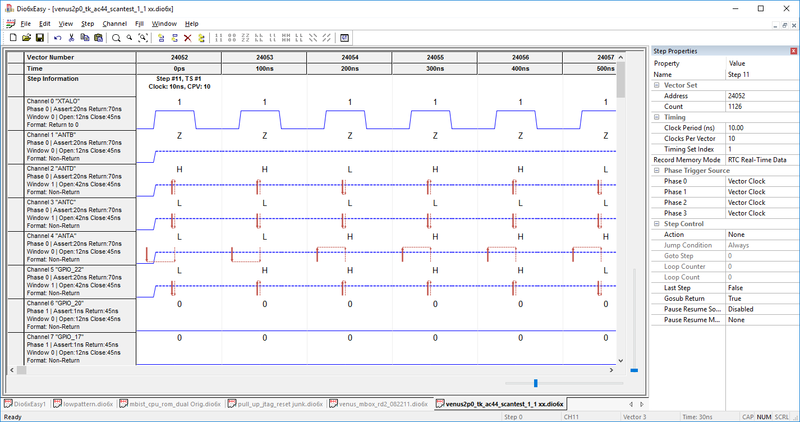 Additionally, all I/O pins can be plotted on the same graph, providing an easy way to compare a device's ESD diode I-V curves. (see figure below) The ability to easily measure I-V characteristics and plot the results is a key feature for failure analysis and design verification applications. This test method can provide insight into device failure mechanisms that can affect a device's I/O pins, such as electrical overstress (EOS), electrostatic discharge (ESD), bond wire problems, and packaging problems. And more recently, the use of I-V curve plots as an "impedance signature" may be useful in identifying counterfeit devices where the impedance or I-V signature of a known genuine part is compared to a suspect part. ICEasy's Shmoo plot tool allows users to easily vary test parameters on both the X and Y axis without programming - allowing test engineers to visually observe the pass / fail operating ranges of the device under test. An accepted test methodology for device characterization and qualification, the Shmoo plot provides users with a powerful technique for design verification and early production test qualification. 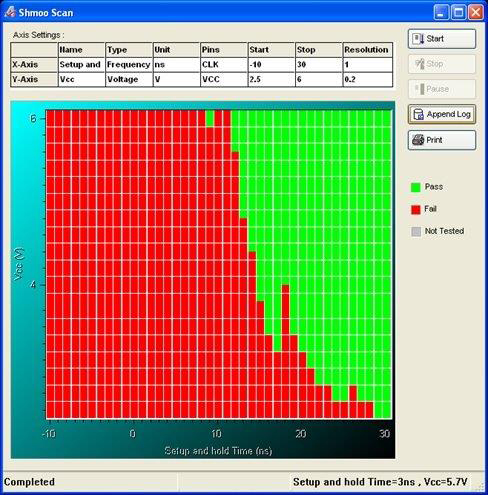 Supporting both automated and interactive control, ICEasy's Shmoo plot tool allows users to change parameters on the fly or to control the test via the TS-900's test manager (ATEasy®) as well as logging the resulting data. Marvin Test Solutions' file import tool option offers test engineers a software tool set for importing and converting STIL, WGL, VDC/eVCD and ATP files to a Marvin Test Solutions digital instrument file format and is an option for the GtDIO and GtDIO6x digital instrument software. This file import tool also works in conjunction with the digital waveform display and editor software which provides an efficient tool set for developing, debugging, and executing digital test vectors. The Standard Test Interface Language (STIL, IEEE-1450) was developed by a consortium of several test equipment, computer aided engineering (CAE), computer aided design (CAD) and integrated circuit (IC) vendors. The standard provides a common language to transfer digital test data vectors from the design environment to the test environment. The Waveform Generation Language (WGL, pronounced "wiggle"), is a data description language created by Test System Strategies Inc. (TSSI). A WGL file is essentially a text file that contains signal patterns along with timing, diagnostics and other information. The WGL vector formats are commonly used by engineers to test semiconductor devices during the design validation and production test phases of product development. These vectors are generated by electronic design automation (EDA) tools and are used to test a device and verify that its physical implementation matches the results achieved in simulation. The VCD and EVCD file formats are part of the IEEE-1364 (IEEE Standard for Verilog® Hardware Description Language). Extended VCD (EVCD, IEEE-1364-2001) is a newer version of the VCD file format and supports directional data. The ATP file format is a file format used with Teradyne digital subsystems. DIOEasy-FIT and the GTDIO library provide the functionality for importing STIL, VCD, WGL and ATP files and converting them to a DIO file format which can then be loaded into DIO cards. When importing a file, the user can specify the clock rate for the digital instrument's step rate (for example the default value of 10 ns (100 MHz) is the fastest clock rate for GX5292 board). If the specified clock rate is too slow and cannot satisfy the timing constraints defined in the imported file (e.g., clock > UUT output probing window etc. ), an error is returned. 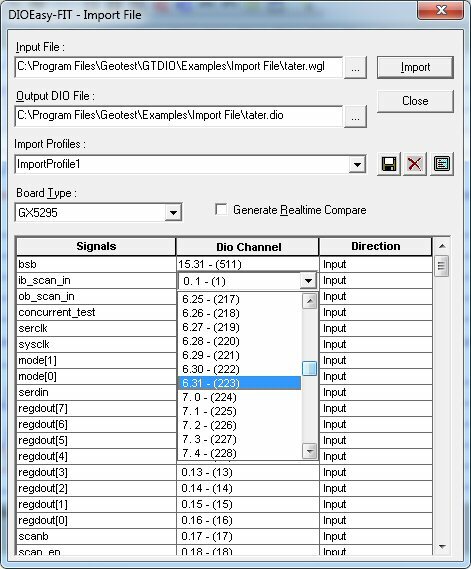 The generated DIO file supports both stimulus / response and real-time compare (RTC) modes of operation. DIOEasy-FIT supports the GX5292, GX5293, and Gx5295 digital subsystems. GtDio6xEasy-FIT and the GtDio6x library provide the functionality for importing the above files and converting them to a DIO file format which can then be loaded into DIO cards. When importing a file, the software will analyze the input file and create an MTS digital file that is compatible with the GX5296's capabilities while preserving, as closely as possible, the input file's functionality and timing. 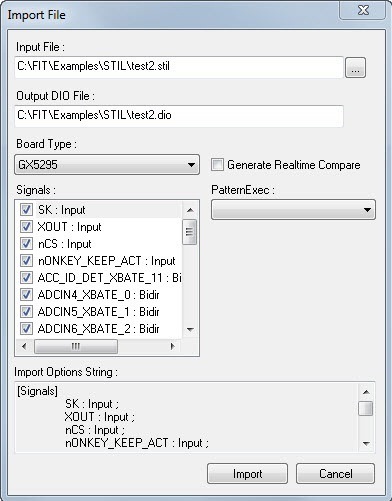 The generated DIO file supports both stimulus / response and real-time compare (RTC) modes of operation. GtDIO6xEasy-FIT supports the GX5296 digital subsystem. GtDIO6xEasy offers test engineers an efficient tool for developing, debugging, and executing digital test vectors for Marvin Test Solutions' GX5296 digital subsystem which is used wth the TS-960 test system. Vectors can be loaded to / from the digital instrument using the tool's interactive panel. 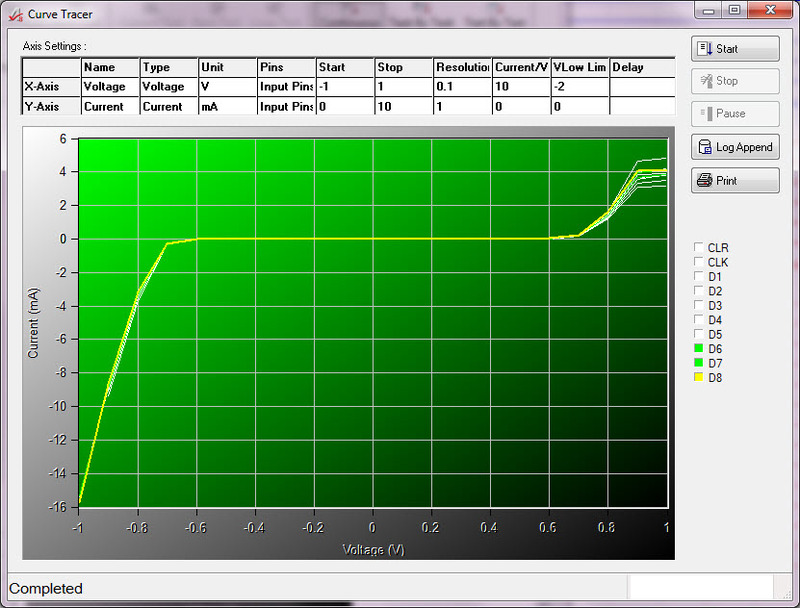 After loading the vectors, the user can arm and trigger the instrument for generation / acquisition of test vectors. Acquired data can be saved to a file or displayed via the tool's waveform display interface. Both drive / capature and real time compare modes of operation are supported by the tool. The GtDIO6xEasy GUI offers interactive digital vector editing and viewing capabilities. The interactive user interface provides a waveform display for each DIO channel and includes channel properties, state, and timing information. The UI also includes information regarding sequence steps, timeset assignment and phase / window timing. A single UI presents all channels for a multi-card digital subsystem, simplifying overall control of the digital subsystem. DIOEasy offers test engineers an efficient tool for developing, debugging, and executing digital test vectors for the GX5295 digital subsystem which is used with the TS-900 test system. To simplify vector development, DIOEasy provides users with an easy to use interface. Toolbars and menus provide quick access to vector editing and viewing tools. Vectors can be loaded to and from the DIO instrument using the DIO Virtual Panel. After loading the vectors, the user can arm and trigger the instrument for generation / acquisition. Data captured from the boards can be saved to a file and/or loaded to DIOEasy for viewing or for comparison against a previously defined vector data file. DIOEasy's GUI offers interactive digital vector editing and viewing capabilities. DIOEasy produces vector data files that can be directly used by the digital instrument’s driver (GTDIO). The DIOEasy GUI is similar to a spreadsheet application. Each cell represents the state of a single data bit in a given step. The data bits (channels) are represented by trace lines in the rows of cells, and each step is a column of cells. Compare two vectors - differences in any cell are highlighted. Vector conversion - DIOEasy can read and convert data vectors from ASCII files generated by other simulators and pattern generators, or you can save the created data file in a simple ASCII format file, with or without commands. The resulting file may then be edited with any text editor. Supported sequencing commands include branching instructions such as Loop, Jump, Call or commands that assign a given value to a specific register. Most commands can be conditional. Supported branching conditions include EQ, NEQ, GT, LT, etc. Inserting/editing commands are done simply by clicking on any step and then filling in the cells when the Command Properties dialog box appears. Sequence steps can be assigned a label, a command, or both. DIOEasy allows you to create, design and edit vectors using Microsoft Visual Basic Script™ (VBScript)—a popular scripting language. Using the capabilities of VBScript and DIO ActiveX objects, the user can write complex programs that create and modify DIO vectors. Setup / configure a digital instrument, i.e., set frequency, trigger mode, etc.